A decade ago I wrote a book – Navigating Cape Identities: Exploring Roots in South Africa. The book was reprinted three times and widely disseminated and it stimulated much discourse and debate. Part of the process of writing that book was my exploration of my own cultural heritage as an African of Camissa heritage, itself an exploration which took 30 years of looking into my roots which brought to the surface 26 ancestors who were slaves from Africa, Indian and Southeast Asia; 5 ancestors who were Khoena; and 19 who were Europeans. I have continued writing over the last decade and spread my papers around to encourage further debate and discourse. These ideas were taken up by artists, dancers, writers, film-makers, tourism companies, radio and television and brought to larger audiences. I also involved myself with a great project that Elna Boesak put together – a six part series “Os Geskiedenis Tussen die Kraake”. In addition, I worked on a business plan with Dr Jatti Bredekamp to transform the old cultural history museum occupying the slave lodge building and to have it renamed the Slave Lodge Museum. Then 15 years ago I produced an exhibition called “The Ties that Bind Us” which was shown at the Slave Lodge Museum for a year before touring the province. In 2010 I was awarded Provincial Honours for my contributions to building heritage awareness, promoting memory and bringing to light intangible aspects of our past. Some of the ideas inspired large projects like those of Dali Tambo, the Adelaide and Oliver Tambo Foundations, and National Heritage Project that asked me to research and write over 20 biographies of national figures, and advise sculptors who had been commissioned to create life-size images of them for a National Heritage Park in Pretoria. The AfriKaaps multi-media song, poetry and dance stage show extended the privilege to myself and the late great Dr Neville Alexander of offering guidance and participating in the show, which played to audiences of thousands and then even more through the video produced by Dylan Valley. An emerging Cape Town Museum had me working as researcher-writer with Sylvia Vollenhoven and Basil Apollis on twelve mini videos of lesser known historical figures. Presently I am working on a three part television series on “The Ties that Bind Us.”. I mention these things in answer to a question put to me many times – “What is heritage activism?” While these activities give examples of what is done practically the core of what is done by a heritage activist is to expose hidden or supressed heritage; and to deepen understanding of the past so as to show people how knowing our past assists us in navigating the present and work for a better future. As I have entered the world of the beginnings of old age, my ‘activism’ has mellowed into being more of a ‘Heritage Whisperer’. This means that one uses one’s time and energies by strategically finding young receptive ears and minds into which one can whisper the stories of that which is still hidden. It involves leaving a legacy in written and audio-visual work to point young people in the directions of explorations still to be done. 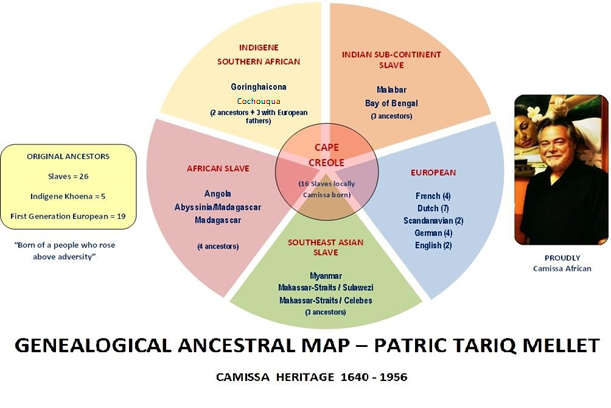 Over the last two decades I have promoted the concept of “seven steps in Cape identity and Camissa heritage” linked to the symbolic seven steps of District Six. I have also promoted the Camissa Embrace and Camissa as an alternative to the demeaning and racist term “Coloured”. I have promoted the need for Camissa people to reclaim their African heritage and identity from those who have de-Africanised them. Over the last 20 years over sixty companies have begun to carry this name and it is widely used by many. Recently Clarence Ford of Heart Radio, who has a business called Camissa Solutions, and the entertainer extraordinaire Allistair Izobell and I engaged in a dialogue through a public meeting and found that there is an appetite among people out there to rally to a name that really speaks to who we are instead of this “Coloured” label. But, there is also an appetite for demanding not to be marginalised or discriminated against. People want their dignity and equality and respect as South Africans and as an African people second to none. I still also believe that my greatest wish could come true, to have a museum in Cape Town dedicated to the story of the peopling of the Cape – the Camissa story. Gallerie de Camissa remains a dream that I hope will materialise one day. It would be a place of visitation with exhibits that explain the story between the covers of this book. This is a very different story to the dominant narratives. Such a museum would also seek to reconnect the Camissa people with their African brothers and sisters across South Africa and across the continent of Africa. I have noticed over time that many websites in the tourism arena and others carry a lot of my work, most often without accreditation. I have also seen printed works where parts of my work appear as though it is that of others, sometimes even containing a mistake or two made by me in one version and which in later versions I have corrected. This of course goes with the territory in allowing an open-source approach to the work done. My stated role is that of a teacher, story teller and heritage activist rather than that of an academic. But what does tick me off is when people not only use my work without acknowledging that it’s not their own, but also warp its original intent or put inappropriate or even commercial spins on it. Having left school in my teens without a full high school education to go work in a factory meant that I had no long and solid basic educational grounding. It was hard work catching up through self-instruction, night classes and technical artisanship training and education while working. Besides drawing from the reading habit inculcated in me by my lowly educated working class mother, was helped to improve my thinking and writing skills through political classes in the liberation movement under such great tutors such as commissars Professor Jack Simons and Mzala Jabulani Nxumalo. In my forties I was accepted on a university Master’s Programme and attained a distinction for an MSc degree where Cape Indigene and Cape Slavery heritage as a focus area in heritage tourism development and management was the focus of my dissertation. But doing a degree part time does not drum into one’s head enough about the protocols required when pursuing research. However, someone did come along and drummed it into my head for me, namely the late Dr Robert Shell, who gently but forcefully in a heated exchange with me, impressed on me that one had to painstakingly cite sources and accredit those whose work you build your case on. He referred to me as an organic intellectual with rough edges and that people would wink and call me “Van Anderen” if I did not pay more strict attention to the protocols of research work, even if my role was that of a community elder and teacher. It was a good lesson learnt. Nowadays I become exasperated when I see others presenting my work as though it’s their own. However I do strongly believe in open access and that distinctions must be made between those seeking recognition for academic prowess and those who are simply educators. I therefore decided to put all of the essays I have written over the past decade and more into a book and give them a coherent thread. I did this after many requests for a single book where people could begin to explore key facets of the past which are hidden, or fall between the gaps of the dominant stories. Much of the new work being done in the arena of history and heritage education simply puts a spin on old skewed stories and presents them as post -colonial thinking, when they are actually just rehashed myths and colonial perspectives. People starved of material will ‘ooh and ah’ in wonder but after a while it will be found that the new work has not actually assailed the key planks of thought peddled by colonial perspectives on our past. I felt that there were some key areas to focus on, rather than attempting to present a comprehensive micro historical tome or almanac of South African history with bells and whistles. This meant looking critically at key myths that have been unwittingly embraced by many in our community. By tackling these myths I believed I would be taking the first faltering steps toward a post-colonial and post-Apartheid evaluation of the past. I also chose to focus on the history and heritage of the Camissa (“Coloured”) people because its message also resonates with many other stories of the peopling of South Africa. The first myth is that there really was no civilisation in South Africa before Europeans arrived. Then there is the myth that there was a single indigenous people called Khoisan who were the “First People” of much of South Africa. This myth worked hand in glove with the “otherwise empty land “ myth. And of course then there was the myth that a people labelled ‘Blacks’ or ‘Bantu’ or ‘Nguni’ invaded the land of the ‘Brown People’, who were seen as naive primitives, part human and part beast, living as noble savages. These myths blotted out a complex 2000 year old history of the peopling of South Africa before colonialism. Thus I felt the need to start with an exploration going back to the first formations of new societies in Southern and South Africa when there were no borders – 200 BC. Thereafter there is the myth or dishonest story about how the port city of Cape Town was started. A related myth is that indigenous South Africans were isolated and innocent of the broader world. The entire story of the Khoena, their long relationships with those of predominantly Sub-Saharan ancestry labelled as ‘Bantu’ or ‘Nguni’, the nature of their societies and so on, required a closer look because there were many who were stereotyping ancestral linage and playing into the notion of the ‘noble savage’. In the popular history focus on pastoralists and agro-pastoralists, the whole arena of the only ‘first People,’ the San, as a distinct people with many diverse communities all over Southern Africa and in the Cape, gets drowned out. The /Xam, more than any of the later migrants including the Khoena, have their story expunged as surely as they were physically expunged. The genocide of the /Xam or Cape San and all who participated in this requires a light to be shone on it. There is also a new wave of dishonest stories, in which history is deliberately being falsified around the Khoena (or Khoi) as a cover for racist and fraudulent behaviour, and those under greatest threat from this are the genuine Khoena (or Khoi) revivalist formations. It will be up to them to challenge and expose such people and take the necessary steps to distance themselves from their utterances. These dodgy fake Khoi characters can be likened to the old Afrikaner Weerstandsbeweeging (AWB) and their leader, the late Eugene Terreblanche, except that they are people of colour. I need to be clear here and ensure that the reader understands that I differentiate between false and fraudulent Khoi revivalists and the genuine Khoi Revivalists. The latter do not make alliances with those responsible for the ‘Crimes against Humanity’ as per the UN and the Rome Statutes of the international criminal court. The latter also do not engage in racist tirades against fellow Africans. Most of the fake and fraudulent Khoi/Khoisan are likely to have no ancestral link to the Khoena and certainly none to the San. This is the lunatic fringe sector who have infiltrated the heritage arena under the banner of Khoisan revivalism. Their every utterance is framed by race-hatred and exclusivist claims based on pseudo-history. They speak of starting a war for the secession of the Cape as a country of so-called pure Khoisan, who in their opinion are effectively people labelled ‘Coloured’. They have created false historical tribes, kingdoms and an empire. Much of this is based on intellectual bankruptcy and ignorance where a few colonial texts with Dutch speculations are seized upon to make the wayward claims. Every second one of these characters claims very specific ancestral lineage and royalty. Their manner of talking and reasoning displays some deep psychopathic personality disorders as well as serious delusional behaviours. The term ‘Khoisan’ itself was coined by a German zoologist Leonard Schultz that experiment on Nama and Herero people imprisoned in concentration camps in Namibia and who used the decapitated heads of those Nama killed in acts of genocide. I mention the differences between false and genuine movements of memory of our Khoena (or Khoi) heritage to address those critics who because of the really unacceptable behaviours of ‘othering’, have sought to dismiss all Khoi revivalism and their claims. The critics are right to condemn the unacceptable behaviours but wrong to use this to deny the legitimacy of the Khoena as an African people. My work has clearly demonstrated that by 1904 there were 96 000 Khoena, and their communities – Nama, Korana, Damara, Griqua and Cape Khoena. It also acknowledges that the UN, ILO and AU all recognise that such communities exist, including the Revivalist Cape Khoena. Today they make up at least one third of the population labelled ‘Coloured’ and they do have the right to be recognised as Africans with these heritages. But my work also addresses the other larger component making up two thirds of those classified as ‘Coloured’ and shines a light on this historical and cultural heritage which also is marginalised and unrecognised as an African people – these are the Camissa people who are discriminated against by continuation of their de-Africanisation by the British colonial administration and the Apartheid regime. This book has zoomed in on aspects of South African history to broadly introduce this set of stories to readers and encourage them to go and learn more. This is a subversive book in the tradition of that great African scholar of the Caribbean, Walter Rodney, who was cut down in his prime, assassinated for his challenging pen. ‘How Europe Under-developed Africa’ was Walter Rodney’s most well- known work. This book attempts to prize open the false stifling stories and expose the muted stories at least a little, to show how colonialism has under-developed South Africa and Southern Africa’s land and people, carved her up, and twisted her past. This book also gives a coherent history and describes the heritage of those labelled ‘Coloured’ in a manner that has not been undertaken before. It does not start in 1652 but has its genesis, along with all other Africans of Southern Africa, where the peopling of South Africa began, namely with foundation communities along the Shashe and Limpopo rivers. It is a story that does not promote the notion of Khoisan vs Bantu/Nguni. It looks at how much more intricate a story exists of the birthing of many peoples in a particular region, who then fan out to different parts of South Africa over 1800 years. It talks of the embrace of three rivers – the Limpopo, the Kai !Gariep and the Camissa. The Camissa embrace shows just how diverse peoples from Africa, south Asia, southeast Asia, China and Europe first met at a shoreline frontier and evolved from there on the two trajectories of oppressor and oppressed. Our history has always focussed on the oppressors’ story, whereas this story talks to the history and heritage of resistance and of rising above the adversity. It’s about an emergence of a Camissa African people with a vibrant culture and a legacy second to none. This story is aimed at cultivating a liberation experience. Our ancestors’ story of taking a resistance road, meeting one excruciating experience at a time but surviving and rising above adversity is something to be very proud of. Their contributions to development are something be very proud of and to celebrate. This is a book about the important role of memory in freeing us and enabling us to know where we are located in South African and African history. Camissa people do not have to walk in the shadows. We can be immensely proud. We can claim our African-ness and we can just like any other cultural group say, “I am Camissa and I am an African who is proud to call myself South African.” It is in finding out who we are that we are able to show leadership and blaze a path to where we want to be. In South Africa there are Africans who are proud of their diverse heritage and the ties that bind us. As Camissa we are one of those diverse African cultural heritages. In South Africa we long for the day that those who cling to “whiteness” shed this colour obsession and proudly share their Afro-European Culture with us in an equal and respectful manner. There is no need to keep ‘white’ and ‘whiteness’ alive. This is not a heritage and it is not culture – it’s a notion of colour and ‘race’ and ‘race-supremacism’. South Africans of Afro-European heritage should celebrate and develop an Afro-European contribution to South Africa if they really want to put the past behind them and embrace a brave new future. Likewise to those with a proud Afro-Asian culture with all its sub-tributaries – celebrate this and your love for South Africa and embrace all others. We accentuate our diversity rather too much, beautiful as it may be, and focus too little on the “Ties that Bind Us”. We need to get to a place where we are all as proudly Mzantsi as we are proud of our diverse sub-cultural heritages. Race and colour-coding do not have a place in our future. The future is in our hands. We should never navigate this future by ‘othering’ our fellow South Africans. We should always maintain dignity and integrity and never bring our communities into disrepute. I am proudly Camissa; proudly African; and proudly South African with no contradiction between these facets of my identity. I am also an internationalist and so much, much, more.